This is a product-provided, sponsored conversation that contains affiliate links. I received two canisters of Viactiv Calcium Soft Chews for my own personal use. All opinions, text and experiences are my own. Did you know that almost 70% of women are calcium deficient? That’s a huge amount but what’s even scarier is that 86% of teenage girls don’t get enough calcium in their daily diets! This is extremely important because 95% of bone building happens by the age of 20. I want to make sure that my daughter, who is 11, knows how important it is to build strong bones and takes care of herself. My daughter is an incredibly picky eater. I keep hoping it’s “just a phase” and she’s going to grow out of it. Truth be told, it’s been like this since she was a baby and honestly has just kept getting worse. I really do worry that she isn’t getting the right vitamins & minerals that her body needs. In a recent federal survey, only 15 percent of high school students drink milk; only 9% of them were teen girls (luckily for me, Ashlyn does like drinking milk! ), Now is the time to start helping her build those strong bones. One area I can help her in is getting calcium in her diet. I know that I don’t always take care of myself either so Ashlyn and I have started taking Viactiv Calcium Soft Chews together. We’ve started out with a canister of caramel soft chews (my favorite) and milk chocolate soft chews (Ashlyn’s favorite). It’s so much easier (and tastes MUCH better) to chew one than it is to take a big vitamin each morning! Each Viactiv Calcium Soft Chew is individually wrapped, so it’s easy to toss one into a backpack, purse, or lunch bag, plus easy to share so other people in your life can try it themselves. Viactiv Calcium Soft Chews provide 100% of the daily recommended amount of calcium and are also the #1 doctor recommended calcium supplement chew. We’re building strong bones together, now and for the future. 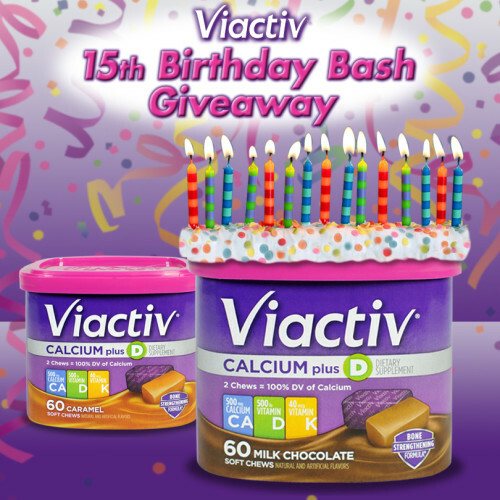 There’s also a giveaway going on over at the Viactiv Facebook page celebrating the brand’s 15th birthday, with 15 monthly winners announced on the 15th of each month! Each month, 15 winners will randomly be chosen to receive 2 canisters of Viactiv Calcium Soft Chews in the flavor of their choice. The winners can keep one canister and share the other one with someone else (teen daughter, sister, best friend, mother or another special woman in your life.) Winners will be chosen on: 4/15; 5/15; 6/15; 7/15 (60 total winners). Winners are announced on the Viactiv Facebook page so make sure you head on over there to enter! There will also be tips on bone building, exercises and more from their registered dietician nutritionist, Heidi Diller! You can find Viactiv Soft Chews at Walmart, Rite Aid, CVS, Target, Walgreens, and drugstore.com. You’ll find a lot more information about teen calcium needs when you visit Viactiv’s website. What's in Your Purse? I'm Rocking U by Kotex in Mine!